New Music Matters: Another Summer 2013 Anthem, "Dumb Disco Ideas" by Holy Ghost! 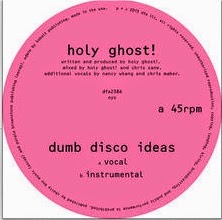 Another Summer 2013 Anthem, "Dumb Disco Ideas" by Holy Ghost! Here come the summer anthems -- Daft Punk's "Get Lucky" and Empire of the Sun's "Alive" are already getting plenty of airplay, and now there's "Dumb Disco Ideas" by DFA artist Holy Ghost! If you haven't checked out the recent Red Bull Academy film, "12 Years of DFA Too Old To Be new, Too New To Be Classic," I highly recommend it. Why do I love this record label? Let me count the ways via fave bands... home of LCD Soundsystem, YACHT and Holy Ghost! Their credo is basically that all music is dance music if it's any good. Holy Ghost! is a synthpop duo comprised of Nick Millhiser and Alex Frankel, classmates back in elementary school on Manhattan's Upper West Side and now bandmates based in Brooklyn since 2007. Their song, "Do It Again" from their self-titled debut, punched up my Summer 2011 New Music Playlist. "Dumb Disco Ideas" is from their next album, Dynamics, due later this year. The song passed my kitchen solo test right away -- I had no choice but to stop what I'm doing, crank the music and dance. Bonus points for making me take off my shoes, glasses and a layer of clothing (after all, it's over eight minutes long!) This tune is crafted with a DFA requisite dance beat and tongue-in-cheek mode, as in clear the floor to get ready for some fun. You can even snap up an instrumental version along with the single on iTunes. Now we just need some sun.